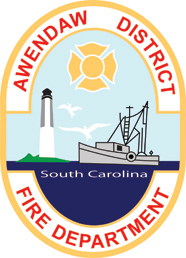 The Awendaw Fire Department provides fire and life safety services including: Medical First Responder, Rural Search & Rescue, Auto Extrication, Wildland Fire Suppression, Fire Inspection and Public Fire Education services to the citizens of the unincorporated areas of Charleston County north of Mount Pleasant. Serving 365 square miles with a suburban/rural interface, federal forest land and coastal areas, the Fire Department's direct service area includes the Awendaw area, Boone Hall, McClellanville, South Santee, and Germantown area and the towns of Awendaw and McClellanville. Services are provided by both career and volunteer members who operate out of six station locations. All stations are under the command of a Battalion Chief and are divided into three working shifts (A, B and C). The department works a 24/48-work schedule. All career fire personnel are Charleston County employees. The Fire Chief reports directly to the County Emergency Management Director. The Battalion Chief reports directly to the Fire Chief, and duties include emergency response and incident command, the direction of training, and the daily supervision and direction of the station Lieutenants and Firefighters. The Awendaw Fire Department maintains a high level of professional standards, focusing on education, certifications, performance measures and fitness. Among other certifications, many full-time personnel are certified medical first responders. A constant state of readiness is maintained to be fully prepared to respond to various emergencies (firefighting, medical, vehicle extrication, hazardous materials, etc.). In 2001, the Insurance Services Office (ISO) gave the Department a rating of 6, acknowledging its professional achievements and therefore saving homeowners thousands of dollars in insurance premiums. One of the most popular Fire Department members is "Dottie", a Dalmatian dog permanently assigned to Fire Station 2. Dottie assists department personnel with public education events, parades, etc. Q: Why do fire trucks sometimes respond where there is a medical emergency? A: The Fire Department's firefighters are trained, certified medical responders and are often in closer proximity to the patient than the Emergency Medical Service (EMS). Therefore, they will often serve to assist patients until advanced life support services arrive via an EMS unit. The Awendaw Fire Department was awarded an Insurance Services Office rating of 6 in 2001. This means a substantial reduction in insurance premiums for property owners in Awendaw and McClellanville, saving them thousands of dollars each year. The Awendaw Fire Department is financed through taxes paid by residents living within the tax districts and municipalities served by the Department. With the establishment of Charleston County's responsibility to serve the Awendaw Special Tax District in 1983 (based on petitions and a referendum), the County took over the Awendaw Volunteer Fire Department's one fire station. The Awendaw Fire Department now serves a larger geographic area, and with increased development, it has six stations, 28 full-time employees, 7 temporary part-time employees, and 12 Volunteer Firefighters. The average call volume is over 1,000 calls per year.